Instead of each organisation putting in its own comments to the Council’s consultation on the future of Leith Walk, Greener Leith organised and coordinated a joint submission, endorsed by the 3 local Community Councils, Edinburgh’s civic watchdog the Cockburn Association, Leith Open Space, Friends of the Water of Leith Basin, and 3 national organisations, Living Streets, CTC and Pedal on Parliament. The draft submission was also ‘crowd-sourced’ on Greener Leith’s website, enabling members of the public to comment, before the final version was approved by all the above organisations. Such a joint submission is unprecedented and must carry great weight when the Council finalises its decision-making on the future of the Walk. The full submission [pdf 2.9MB] and a related Greener Leith press release [pdf 80k] can be downloaded here or from our Leith Walk web page. Greener Leith’s own public consultations during 2012 [see item 1208 here] had already identified cycling conditions as a top concern of the public. This ties in well with the fact that Leith is probably already the city’s second busiest area for bicycle use, after south-central Edinburgh [see Active Travel Action Plan, referenced in section 3 of the submission]. It also ties in with a 2010 Spokes survey which identified the top 2 Edinburgh ‘corridors’ needing improved cycling conditions as City Centre to Leith and Princes Street/ East-West across the city centre. Spokes worked closely with Greener Leith on the detail of cycle facility aspects of the joint submission – and, of course, this detail had to be, and was, then agreed (with minor modifications) by all the other signed-up organisations. so that cyclists feel safer and aren’t squeezed between buses and other traffic as they travel uphill. See appendix 2 of the submission for more on this. The protected lane would become fully segregated above London Road roundabout [as the council already proposes]. A segregated and/or protected downhill cycle lane as far as Pilrig, followed by the widest possible bus/cycle lane. A 20mph speed limit the whole length of Leith Walk to boost road safety and to make the Walk feel less traffic-dominated. Complete redesign of many of the key junctions to make the Walk more pedestrian and cycle friendly. Improved conditions at the two roundabouts – though ideally both, or at least London Road roundabout, would become traffic-light controlled, as was planned at London Road had the tram gone ahead. See the full submission for more detail on what we have jointly proposed. 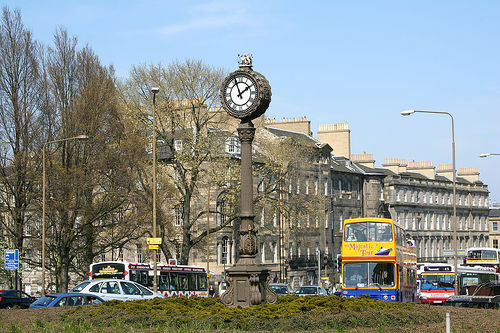 If you live or travel in Leith/ Leith Walk area and support these ideas, please contact your own councillors – even if they are not from Leith area, they will be involved in voting on the outcome of the council consultation. Give them the link to the joint submission – or to this article – and ask them to speak to the council’s Transport Convenor in support of it. Of course, if you feel the proposals are not sufficiently radical, feel free to give your opinion! Find your councillors at www.writetothem.com. Send us any useful replies. The council officials will now draw up a probably-final design, hopefully taking full account of the consultation. This is expected to be reported to the Council’s Transport and Environment Committee on 19 March 2013.